By turns an enemy of the state and the toast of Hollywood, Miloš Forman is the most successful director to emerge out of the Czech New Wave of the Sixties. Now 76, he remains best-known for the popular (and mostly critical) successes of two Oscar-laden films: One Flew Over the Cuckoo’s Nest (1975) — for which he beat out Stanley Kubrick, Federico Fellini, Robert Altman and Sidney Lumet for best director — and Amadeus (1984). Forman’s roots in satirical anatomies of social institutions and the liberating inevitability of comic anarchy are on full display in The Fireman’s Ball. The 1967 film was Forman’s second feature, a boisterous, free-floating ensemble piece about a disastrous celebration in a Czech village, as a posse of local firemen attempt to honor their 86-year-old former chief. Official reaction to the film, whose release coincided with the Soviet clampdown after the 1968 Prague Spring, made it expedient for Forman to become an expatriate. Last month, the Brooklyn Academy of Music’s BAMcinematek ran a revival of the film. STOP SMILING spoke by phone with Forman, who lives in Connecticut. Stop Smiling: Could you talk about the circumstances behind the making of The Fireman’s Ball? 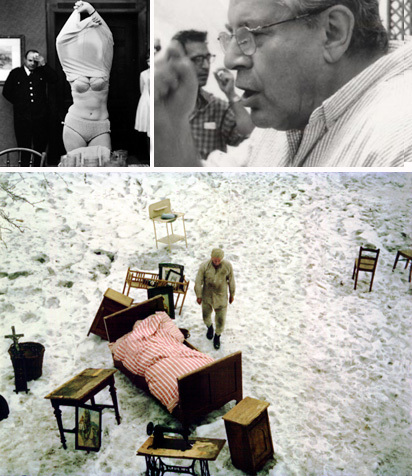 Miloš Forman: The film was made in 1967, a time of relative relaxation of the Communist grip on control of culture and censorship. It was not that suddenly everyone could do whatever they wanted. When we wrote a screenplay, there were certain things I knew I wanted in the film that we didn’t put in the screenplay at all so we wouldn’t irritate those who would be deciding if the film would be put into production or not. Then we shot it later and we see what will happen. I was encouraged by the fact I arranged the co-production of the film with the Italian producer Carlo Ponti, who invested $65,000, which was not much. Still, he had the rights for the film for outside. If there were problems in Czechoslovakia releasing the film, the film could be released abroad. I thought I was very clever arranging this, but obviously I was not. Because when Carlo Ponti saw the film he had the same argument that as the Communist censors: That the film is showing the hard-working Czech firemen in an unflattering light and that that will turn off the audience. He refused to take the film. Francois Truffaut and Claude Berri saw the film and bought it from Carlo Ponti. When Ponti asked for his money back, I got a letter from the government saying I would be sued for economic sabotage of socialist economy. In those times, this meant 10 years in prison! I was panicking. But then Claude Berri paid back Ponti, and the Communist government didn’t have to give Ponti back $65,000, and I was off the hook. MF: The irony is, the film was released in the second half of July in 1968. It was in the theaters for two weeks. When the Russian tanks occupied Czechoslovakia, immediately the film was banned officially forever. So what in Communist terminology means forever is 20 years. So the film was re-released in 1989. SS: You happened to be out of the country at the time, which seems very fortunate for your subsequent career. MF: I was preparing my first American film, and when I finished the film and was supposed to go back, I knew that after they had banned Fireman’s Ball forever, I would not be able to work anymore in the Czech studios. So I decided to stay in America. SS: Your cast was mostly non-professional, correct? MF: As a matter of fact, except for two guys who were also amateurs who had acted in my previous Czech films, there are no professional actors. And most of them are really local firemen from that little town where we shot the film. SS: How did you convince them to do the movie? MF: By playing cards and drinking beer with them. For three months, when we were working on the script, every night I was in the firehouse drinking beer them and gaining their confidence and learning anything about them, their personalities, to make it comfortable for me to cast them in the film. SS: Did you then write dialogue for those individuals, or did you find people to match characters you already had in mind? MF: When we started, I had certain ideas I wanted to write about, but then you meet these people and start to spend time with them — then I started to fashion the script more or less on these personalities. SS: They seem like naturals. Did you have to coach them a lot? MF: No, no, no, no, not at all. Once you realize what kind of personalities they have, and pick what you want them to say, then you just let them go. Once they feel confident in front of the camera, and not intimidated by the camera, then they just went on as individuals. SS: It seems like such a gentle and affectionate comedy, watching it now. How did the cast and the village react when they saw it? MF: That’s very interesting. When the film was shown to the censors, they didn’t know what to do. They decided they would screen the film in the little town where we shot the film. [They assumed] the firemen would be upset by being portrayed like this in the film, and they would judge the film severely, and that would give them the pretext to say the people don’t like it, and we won’t show it. So they arranged a screening in that little town and it was overwhelmingly received with enthusiasm. People loved it. The firemen who were in it loved it. SS: They thought they were all great comedians, I bet. MF: No, I think it was a human-type reaction. They suddenly saw themselves not as people but as actors, and they will be for eternity being seen in this film by their children and grandchildren. SS: The film also is an archetypal “village comedy,” and that travels very well from one culture to another. MF: Well, comedy survives much longer than dramas. Look at the films from the beginning of the last century. The drama with — I don’t know, Gloria Swanson, Mary Pickford, like that — you look at it and it doesn’t really work. But look at Charlie Chaplin. Buster Keaton. Laurel and Hardy. It lives, and you can laugh at it today. So, you know, comedy has this longer survival rate. SS: And for you, it’s allowed the possibility to take on some dark topics in several films in a way that is very subversive. MF: To look at the dark side and the tragic side of our lives with a sense of humor is really helping us to go through. It’s helping us to digest the sad parts of our existence. SS: Given all the circumstances, it must not have been easy to cultivate that sensibility growing up. MF: As a matter of fact, the other way around is true. I remember as a child during World War II, when Czechoslovakia was occupied by the Nazis, lots of tragedies were around. But the resilience of the Czech people demonstrated itself in humor. That was the only way the Czech people could fight the misery, to laugh at it. I guess I developed, or understood, the power of humor in those tragic times. When for the people, it was the only weapon to fight their misery. I’m sure that formed my look at life. SS: This is a little bit off-topic but it relates to your situation as a sort of artistic exile from the Eastern Bloc. The last time you appeared at BAM, it was for a rare screening of an experimental film collaboration called I Miss Sonia Henie. (The film was born of several impromptu shorts more or less improvised during the 1971 Belgrade Film Festival, shot by Forman, Frederick Wiseman, Tinto Brass, Paul Morrissey, Buck Henry and Dusan Makavejev.) You told a very funny, and kind of scary, story about that. Would you recount the event? And I looked out of the window and in front of the hotel I see parked three cars, which only secret police were using. So I knew that they were not there to watch the architecture. So I had to leave the hotel at five in the morning through the back door, get in the car with my friend Dusan to take me to the railway station. He didn’t even dare to take me to the airport to fly out. I got on the train with one of his friends, and his friend stayed with me all the way until we crossed the border. MF: Yes. Thank God. He told me, “They are here to take care of you."